Every year during the summer, thousands of students move between properties or away from Durham and Stockton. During this time a large amount of waste is generated in our Colleges and in the local area. The Green Move Out Scheme is a partnership between Durham University, Durham County Council, Durham Constabulary and County Durham Furniture Help Scheme (CDFHS) which aims to reduce waste and to support local charities including County Durham Furniture Help Scheme, Durham Palestine Educational Trust, East Durham Trust and A Way Out. 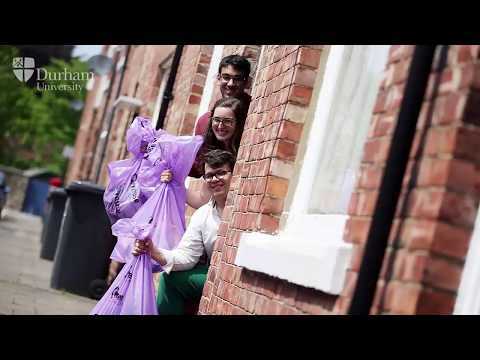 2018's Green Move Out scheme is now finished - Purple bags were collected from students who live out whilst college's communicated their own processes to students who lived in! To find out more why not read through the rest of our Green Move Out pages? Information for students living in a Durham University College. Information for students living in or around Durham City, landlords of Durham student properties and local residents. Please follow local recycling guidance and donate unwanted reusable items to charity shops. The Green Move Out project was a finalist in the EAUC Green Gown Awards 2017, this video formed part of the submission. The Green Move out project is a partnership involving Durham University, Durham County Council, Durham Constabulary and County Durham Furniture Help Scheme. This video highlights the great work of the project and the drive to reduce waste, help the environment and support local charities whilst keeping Durham's streets tidy. The scheme also achieved an Award at the Altogether Greener Environment Awards 2011 and 2015, and was a Finalist in the EAUC Green Gown Awards in 2016 and 2017. Thanks again for your continued support... the donations are making a significant difference to people's lives.